No one likes to queue. Even the British who, it's often joked, invented the orderly line, are getting sick of it. Recent research suggests most Britons are now prepared to tolerate queueing for only four minutes. Yet the average British shopper spends a painful 53 minutes a month in supermarket queues. Together with all the time spent waiting for buses and trains, it mounts up to nearly six months of queueing in a lifetime. Haven't we got anything better to do? No wonder, then, that stores spend millions of pounds trying to reduce their customers' queueing time. 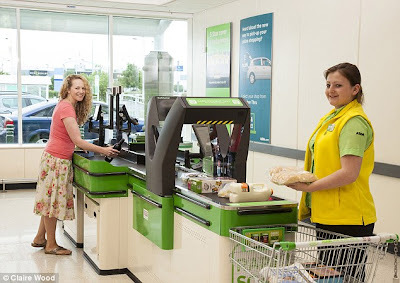 First came barcode scanners, then the super-irritating self-service checkouts made famous for their constant refrain of 'unexpected item in the bagging area'. But now all the waits and irritation could be in the past with the arrival of the Rapid Scan. The scanner, which is being trialled by Asda, can scan products from any angle as they pass through it on a conveyor belt, meaning the check-out operator no longer has to spend precious seconds jiggling the barcode into position. It can scan 100 products in just one minute, which is apparently three times faster than by hand. I filled my shopping basket at my local Asda in Monks Cross, York to try it out and see how it compared with conventional checkouts.